The Most Unique Party Boat in Buffalo, NY! Grab your closest friends and come have some fun in the sun! Bring your own banners & balloons.. don’t forget the cake! 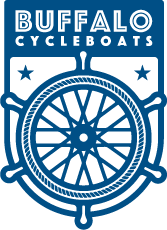 Get your crew and come aboard Buffalo CycleBoats for a fun filled cruise! Break out of the office for the day and come bond with co-workers out on the water! Buffalo CycleBoats is a unique boating experience for any occasion! Whether you call us a boat, a bike, or a floating pedal pub, your experience will be unforgettable! Come aboard our 16 passenger boat, pedal, relax and enjoy the scenic Downtown Buffalo waterways. Pricing starts at $35pp for our 2 hour tour, passengers can bring there own beverages/snacks, pedaling is not required. Our fleet of unique paddle boats are ready for you to come aboard and cruise the shores of Lake Erie in Buffalo, New York. Each cruise will explore the waters of downtown Buffalo on the historic Buffalo River where your crew can explore the waterways that are rich in history. Each tour is 2 hours in length, passengers can bring their own food, beverages, and music. All tours will make one stop during the cruise. We can accommodate up to 32 passengers. Let us help you make memories on the water, celebrate your special event or group outing today!